Whatever you want to call it, it’s delicious. This tu-no salad is egg free, oil free, salt free, and flavorful. You can serve this on a bed of greens, with crackers, in a wrap, mixed with quinoa or on a piece of toast. Whichever way you decide to eat this salad, be prepared to have this become a staple go to meal in your house. Drain and rinse garbanzo beans. Place beans in medium sized bowl and mash with potato masher. Add onion, celery, parsley, and stir. If using avocado, add that now and stir in with other veggies. Add sauce to the beans and veggies and mix together. Serve on a bed of greens, in tortilla wraps, on a slice of toasted Ezekiel Bread, or mix it with quinoa. Hi nurse kristin. Thank you for the healpful information. That you are providing. I want to start a plant based eating plan and this will help alot. Hi Maria! I’m happy to hear that you are going to start a plant based diet. I’m glad you enjoy these recipes. 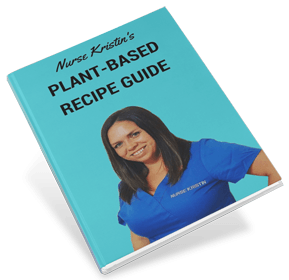 Have you downloaded my plant based recipe guide? There are 10 recipes in that free guide to help you get started. Best of luck to you on your plant based journey. Let me know if you have any questions, I’m here to help.